Boris Continuum Complete 10 delivers powerful mocha tracking & masking tools to Avid & Adobe Editors. Boston, MA, USA – August 31, 2015 – Boris FX™, the leading developer in VFX and workflow solutions for film and video, and Imagineer Systems, the Academy Award-winning developer of mocha® Planar Tracking tools, will showcase the newest versions of flagship products Boris Continuum Complete (BCC) and mocha Pro at IBC on September 11-15, 2015 at the RAI Amsterdam, Netherlands in booth 7.K29. Boris Continuum Complete gives editors, motion graphic designers, and finishing artists the most comprehensive VFX plug-in suite ever created. The expansive 200+ filter collection includes 3D titling; image restoration tools; lens flares, glows, and lights; keys and mattes; warp and perspective effects; and cinematic effects. The upcoming BCC 10 release offers integrated mocha tracking and masking technology, new Beauty Studio skin retouching filter, new 3D titling and animation tools, import of Maxon Cinema 4D models, new image restoration filters, new transitions, and more host support. 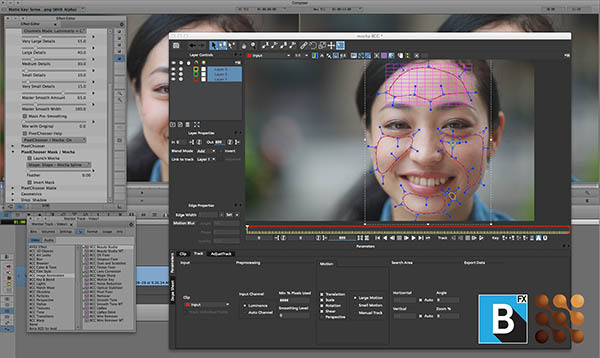 mocha is the award-winning planar tracking and roto-masking software developed by Imagineer Systems. The upcoming mocha Pro 5 release will add the ability to launchmocha Pro as a plug-in from host applications such as Avid Media Composer and Adobe After Effects, a new effects panel for integrated keying, grain, sharpening, and skin smoothing; new Python scripting support, and more. Visit Boris FX / Imagineer Systems at IBC and register to win software prizes in the daily giveaway. September 11-15, RAI Amsterdam, Netherlands, Booth 7.K29. To make a press appointment at IBC, contact Jessie Electa Petrov, Director of Marketing, jessiep@borisfx.com. Boris FX is a leading developer of VFX, compositing, titling, video editing, and workflow tools for broadcast, post-production, and film professionals. Boris FX products have grown to serve over a million artists worldwide. The company’s success lies in its ability to tightly integrate and leverage technologies through strong partnerships with Adobe, Apple, Autodesk, Avid, Blackmagic DaVinci Resolve, Grass Valley, Nexidia, Sony, and other leading developers of video editing software. Boris FX was founded in 1995 and is headquartered in Boston, MA, USA. Imagineer Systems Ltd is the Academy Award-winning developer of visual effects solutions for film, video and broadcast post-production markets. Imagineer Systems has made its mark on countless Hollywood blockbuster films including: “The Hobbit,” “Birdman” and the “Harry Potter” series. Imagineer’s desktop product line consists of mocha Pro™ – roto, planar tracking, compositing, and removal utility; mocha Plus™ – a planar tracking and roto utility designed for After Effects, Premiere and Final Cut Pro users. Imagineer Systems was founded in 2000 and is headquartered in Guildford, United Kingdom. In January 2015, Imagineer Systems was acquired by Boris FX.